The National Basketball Association is the most innovative U.S. professional sports league. Mark Cuban, one of the league’s most prominent team owners, is positioning his Dallas Mavericks as a leader among the pack and nowhere is this illustrated more clearly than through a new blockchain-focused partnership. As part of the original partnership, Lympo acquired the naming rights to the Mavs’ training facility and its logo was placed on the team’s practice jerseys. 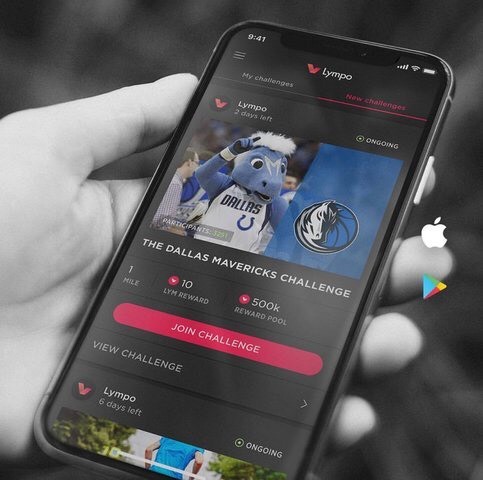 Lympo rewards its users for accepting and completing challenges within the app. “Today, Go Outside And Breathe In Some Fresh Air!” for example, requires covering a distance of 1.2 miles to complete the challenge. Upon completion, the users receive a certain amount of LYM crypto tokens, which can be exchanged for items such as iPads, FitBits and Mavericks tickets and gear. Given the potential of blockchain to have a profound impact on a variety of industries, including sports, Cuban’s interest in Lympo is not surprising. Within the blockchain space, Cuban’s Mavs became the first team to accept Bitcoin and Ethereum as forms of payment for season tickets. This is not the first time the sports industry is leveraging blockchain technology. Currently, fans of four NBA teams and two NHL teams have the ability to upload and potentially receive compensation for the photos taken at games, thanks to KodakOne, an image rights management platform with an integrated blockchain solution. Additionally, the Houston Rockets and AntPool, a Chinese Bitcoin mining company, announced a partnership in September. This came on the heels of AntPool announcing its plans to open a U.S. headquarters in Houston. As technology continues to move forward and its advances take on the mainstream, it will be fascinating to follow the sports sponsorship space. Teams and leagues, always looking for new revenue streams, will surely be watching as well.